Insight’s Steps mark-schemes offer a flexible approach to assessing without levels for schools wanting to use a linear model of assessment. They can be configured to suit your school's approach - you can tell us how many steps you'd like to use, what you'd like them to be called, how you'd like them to be evaluated and even how you'd like progress to be measured. While many schools are moving away from this model in favour of a point-in-time approach to assessment, these mark schemes remain popular for schools who want to (or are under pressure to) report progress in points; to store historical assessments in this format; or who want to show small steps of progress for pupils who are consistently working below their year group. This model is also used by most schools during early years (for assessing Development Matters) and by many schools for assessing using commercial frameworks such as RWI for Phonics. Contact support to ask about configuring a Steps mark-scheme for your school. We can usually get you up and running within a few days. 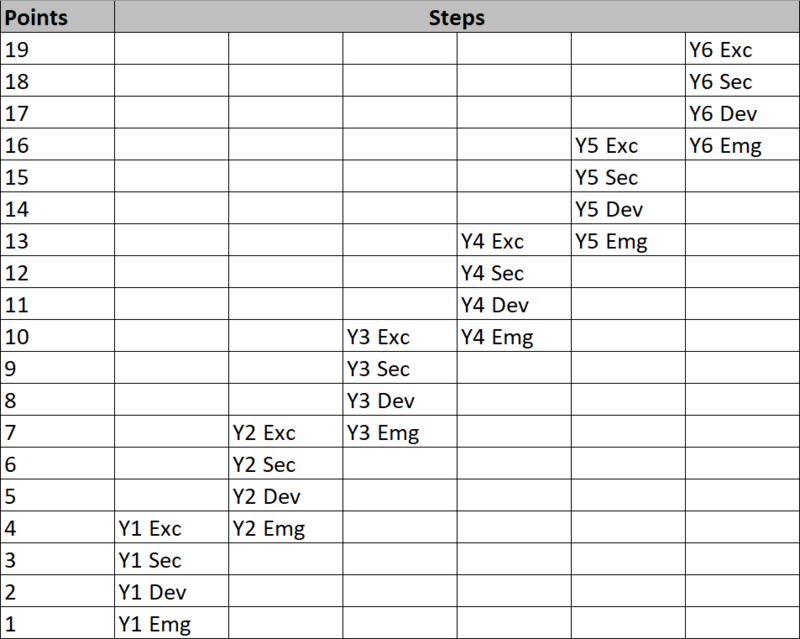 How is progress measured using Steps mark schemes? Progress for pupils assessed using a Steps mark scheme is based on the difference in underlying point values assigned to each step. In some cases, this equates to simply counting the number of steps achieved between any two points. The reason for this is that, in our experience, schools using this method of assessment have an expectation that all pupils should make a specified number of points of progress each year, no matter their starting point. With the setup represented above, a pupil who reached Y1 Sec is expected to make 3 points of progress in Y2 to achieve Y2 Sec. A pupil who reached Y1 Exc is also expected to make 3 points to achieve Y2 Exc. Mapping the underlying point values in this way means that this expectation is built in.